Almost 17 years, that's how long I've been using the Internet. Of course things have drastically changed from my days of sitting in a Year 7 IT class trying to work out how to use Google to do my homework. It's safe to say the way we use the Internet now is a whole world apart from those first few years when the World Wide Web was made more easily accessible to your general person. Social media is even younger, yet quite possibly the fastest growing - and most popular - form of using the Internet. No matter how old you are, what social class you are from, where in the world you live, most people use social media, and for most people, it's something they use daily. I know I for one use social media every single day without fail and I'm not afraid to admit I'm more than a little bit addicted to social media. For me it all started with AOL Instant Messenger, then MSN and MySpace, chatting to friends from school, making new friends online, using song Blink 182 lyrics and old school emoticons to tell the world how I was feeling that day. Finding my way, 'expressing myself' and gaining confidence I really didn't have in person. I wasn't popular in school, I was a complete bookworm and I lived in the middle of nowhere. For me, chatting online was my way of communicating with other people. Everything seemed pretty harmless back then, before the rise of world changing websites and social media channels such as Twitter and Facebook, before the space I once found positive turned negative as more and more people turned to the Internet to spread negativity instead of positivity. The Internet has it's happy spaces, and then it has it's negative spaces. You'll find people who bring you sheer joy just from a simple tweet or status update, a link share or silly GIF, and you'll find people who want nothing more than to bring you down every opportunity they get. Before I started this blog I had other blogs, mainly a Tumblr blog - then again, does Tumblr even count as a blog? - and it was a space I felt very happy and confident with. I spoke my mind, shared my opinion, found communities and formed friendships with like minded people, all whilst sharing photos of everything you can imagine from your harmless floral fancies to the more raunchy affair. My Tumblr was my safe haven, it could be tame and it could be explicit - it was whatever I wanted it to be. But then this blog took over, I stopped using my Tumblr so much and I started using Twitter a disgustingly obsessive amount, more than I had in the previous years I had my Twitter account. I fell in love with Tattooed Tealady, creating my own website and writing post after post, sometimes even posting 3 reviews a day in an attempt to avoid that essay I had to hand in to Uni the next day. I also quickly learnt that being myself; loud, opinionated, not always thinking before I spoke shared something online, having slightly odd interests alongside my love for makeup, well, it wasn't always welcomed. With that came a huge amount of negativity thrown my way, people spewing more hatred whilst hidden behind a keyboard than I had ever experienced in person in my entire life, group mentality on Twitter and websites created for nothing other than negativity and resentment. Gossip, rumours, Chinese whispers and vicious lies - and I was never alone, with this level of negativity being thrown at so, so many bloggers left, right and centre. Like many people who find themselves at the receiving end of online trolls, it had a massive effect on my confidence, my belief in myself and overall, how I acted online. For a good two years after it all began, I really restricted myself and changed the way I would behave online, the things I would share, the kinds of people I would communicate with. I stopped building friendships with bloggers who I knew were friends with people who had 'gossiped' about me, and I stopped creating new friendships with bloggers that tried to get to know me, having learnt one too many times that sometimes people who seem harmless, are often anything but. Stepping on eggshells worried that whatever I said or did would entice more bile, but that's the thing; it doesn't matter what you do or say, because someone will always have something negative to say, there will always be someone ready to turn a positive into a negative and try and push their bad energy on you. The Internet plays a huge part in our lives, we use it every single day, but it's real life that counts. It's so easy to get swallowed up in an online world and forget to live in the everyday, for some it becomes an obsession, an addiction you can't break. Some people use the Internet positively, some people use it negatively. That's just the way it goes. So what do you do? Do you change who you are, do you stop being yourself and sharing your true personality online, in the hopes you won't be targeted? Do you avoid certain social networks, stop doing something you love, close down your accounts? Or do you let them get on with it, carry on with your own life and worry about things actually worth your time? After two years of changing who I was for other people, I opted for the latter. Too many people say "If you put yourself online, you have to expect abuse/negativity/people disagreeing with you/people having something to say about what you do/say/share.". They say it as if it's an excuse for disgusting behaviour, when there is no excuse. Just because you use the Internet, public forums, create content that you are passionate about and want to share, that does not mean you deserve abuse. Constructive criticism, well thought-out advice, a friendly nudge that hey, maybe next time you could try this instead, but never abuse. Heck, even some of the things said about me were welcomed and made me realise that I had some growing up to do and maybe I should tone things down a bit. Like I always say - it's how you put across your opinion that counts. Too many times I see friends, other bloggers, other creators, beating themselves up on Twitter or reacting to the negativity thrown their way. It makes me feel incredibly sad to see people be made to feel so low, so bad about just being themselves, because of the actions of others - especially when those actions are cowardly by default; an anonymous opinion or thought holds no weight, an anonymous action by default is an action of doubt. You will never be able to control the actions and thoughts of others, but you can control how those actions and thoughts affect you. You can chose to embrace the positives that come with the Internet, and avoid the negatives. You can chose to click that block button, you can report that offensive profile, you can shut out the bad and let in the positive. Disagree with someone's views? That's OK, because their views are not your views. Don't like someone? That's OK, not everyone is meant to be friends. Fed up of how often someone tweets, the things they share, the causes they fight for? That's fine, don't follow them, don't visit their sites or profiles. You chose the content you see, chose to see the content that adds to your online experience, that enriches your knowledge, that adds something to your day. You can embrace communities and people that build your confidence and make you feel safe, content, accepted. Like me, you can chose to be yourself regardless of how many people won't like you, because for every person who doesn't agree with you, there will be two that do. If you give yourself the chance, you can realise that you are not the problem. Don't let anyone change you, make you doubt yourself, make you feel like you can't be your true self online. Use the Internet positively and embrace the positive communities of men and women that inspire. Share your passion, present yourself - and your opinions - appropriately, be mindful of others and most importantly, remember this - other people's thoughts do not define you. 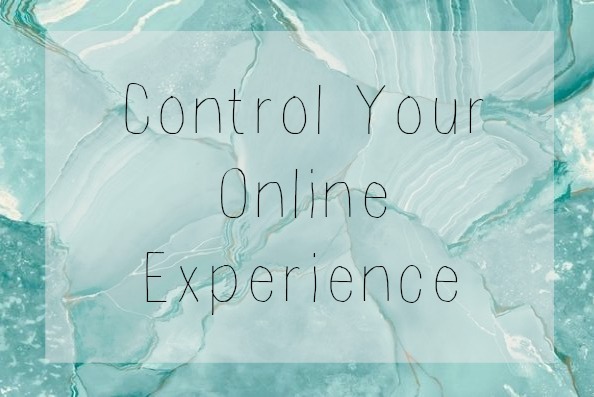 You can control your online experience. I totally agree! Sometimes we see ourselves caught up in that thing that is happening right now of changing our lives on social media or in our blogs to adapt to others and it's awful. We should always be ourselves and do whatever we like regardless of what anyone else can say to us.